The curious episode earlier this week of President Erdogan rebuffing Russian Foreign Minister Lavrov’s request to return Afrin to Damascus’ control was nothing more than a brilliant display of perception management by the Moscow diplomat and confirms his reputation as being one of the most skillful practitioners of this art in history. The world’s been so focused on the US-Russian standoff in Syria throughout the entire week that most people outside of the Arab Republic missed the curious exchange between Russian Foreign Minister Lavrov and Turkish President Erdogan over Afrin, but that’s mostly because it was objectively a “non-event” in the first place and nothing more than a brilliant display of perception management mostly intended for the Syrian domestic audience anyhow. What happened was that Lavrov curiously announced on the same day that Russia once again sat back and passively allowed “Israel” to bomb Syria that Moscow believes that Ankara should hand Afrin back to Damascus’ control, which would restore the democratically elected and legitimate country’s sovereignty over the formerly “federalist”-infested region. 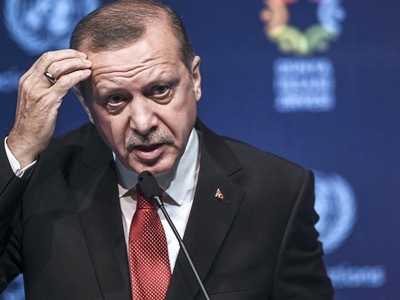 Moreover, he also said that “Erdogan has never said that Turkey wants to occupy Afrin”, which totally contradicted the prevailing Alt-Media dogma that Ankara was supposedly preparing to annex the area as part of some “Neo-Ottoman” plot. This was widely interpreted in the pro-Syrian Alt-Media Community as a crushing blow to Russian prestige and evidence of the weaponized conspiracy theory that Turkey is supposedly moments away from “backstabbing” Russia again and therefore can’t ever be trusted. Should Russia have really believed that this was the case and sincerely felt offended by President Erdogan’s rebuke, then its witty spokeswoman Maria Zakharova would have surely responded, though interestingly enough, there was silence from Moscow’s side and the issue wasn’t returned to. It’s unrealistic to imagine that Russia “accepted the loss” and decided to, as the UK Defense Minister rudely urged last month, “go away and shut up”, so another explanation must be presented. It’s here where careful consideration of Russia’s current strategy comes into play and allows one to appreciate the mastery behind what just happened, but it can’t be properly understood without looking at the background context. The first thing to keep in mind is that Russia is cooperating closely with Turkey over the creation of so-called “de-escalation zones” in Syria that the author warned last May could easily end up turning into unofficial “zones/spheres of influence” in the country. This emerging outcome isn’t coincidental either, but is probably exactly what Russia and Turkey planned together as part of the speculated Great Power “compromise” that underpins the basis of their fast-moving rapprochement that began with Ankara’s multipolar pivot after the failed pro-American coup attempt in summer 2016. Objectively speaking, a large and strong Great Power like Turkey is much more important to Russia’s overall geostrategic calculus than a small and weak war-torn state such as Syria, which means that Moscow might have concluded that it’s better to “balance” regional affairs between these two neighboring Mideast states by giving a tacit “preference” to Ankara’s ambitions over Damascus’. In practice, this takes the form of Russia “passively facilitating” Turkey’s anti-terrorist interventions in northern Syria and subsequent establishment of FSA proxy “spheres of influence” by at the very least not doing anything to stop them, to say nothing of the potential coordination between these two Great Powers in each instance. Returning back to Afrin, there’s no way that Turkey would have been able to commence “Operation Olive Branch” without Russian backing, which Ankara even acknowledged on several occasions, though this Neo-Realist move on the “19th-Century Great Power Chessboard” is unpalatable to many Syrians who can’t stomach the thought of their top military partner cooperating with the country that’s responsible for bringing so much death and destruction to their land. This “populist” perception is based on a lack of awareness when it comes to the larger dynamics of Great Power politics and the strictly anti-terrorist military mandate that Russia agreed to when it was invited into Syria, and knowledge about these two factors would prove that Moscow has no obligation nor intention to protect the Syrian Arab Army (SAA) and that there are reasonable arguments that could be made in explaining why it works with Ankara inside the Arab Republic. Nevertheless, some Syrians oppose the Russian-Turkish Strategic Partnership in principle and rely on their international Alt-Media supporters to channel their grievances to a larger audience, albeit in an indirect and “plausibly deniable” way that doesn’t reflect negatively on their country at large due to the perceived sensitivities of this issue. Russia is clearly aware of this given its world-renowned expertise in intelligence collection and analysis, and it understands the danger of demagogic voices (some of whom might be foreign-backed or based abroad) manipulating this emotional issue in order to produce a nasty anti-Russian reaction in Syria with time, hence why it prudently prefers to publicly downplay any talk about this topic especially when it deals with very controversial issues such as Turkey’s two anti-terrorist interventions into northern Syria. The Afrin issue has been very touchy for many because of the sheer volume of fake news that was spread about it in Alt-Media which resultantly advanced false narratives and engineered their attendant false expectations in Syrian society. As “luck” would have it, “Israel’s” bombing mission on Monday morning provided the “perfect opportunity” for Russia to “kill two birds with one stone”, in that it decided to make what can be described as a “pro-Syrian” statement about Turkey’s military presence in Afrin in order to “deflect” attention away from Moscow’s “passive allowance” of Tel Aviv’s latest attack. In order to ensure that the characteristically capricious President Erdogan didn’t “overreact”, Lavrov began his statement by denying the fake news allegations about the Turkish leader’s falsely reported threats to “occupy” the region and then proceeded to “suggest” that he return it to Damascus’ control, an eventuality that he knew fully well wouldn’t happen because of Ankara’s previous public statements on the matter. As could have been predicted, President Erdogan rejected this proposal, and the exchange between the two world figures captivated the attention of mostly only Syrians and their pro-government supporters abroad. What would have ordinarily been a routine exchange of statements was warped into a “scandalous” episode by the Alt-Media Community, which gleefully propagated the interpretation that Turkey “told Russia off” and that the fear mongered “second backstabbing” was just around the corner. Instead of Syrians indulging in the demagogic “populist” narrative of “Russia betraying Syria” by facilitating Turkey’s operation in Afrin and “passively allowing” “Israel’s” latest strike (which isn’t Moscow’s responsibility to stop anyhow), society’s attention was “constructively” “diverted” to this skillful display of perception management. Russia respects that Syrian society “isn’t ready” to “understand” its Great Power diplomacy with both of those actors and that its previous attempts to have media “surrogates” explain it have been largely futile, so it opted for the “safest” choice in simply “distracting” them instead, which has actually been convincingly effective judging by a review of pro-government chatter in the English-language social media space that reveals a widespread belief that Turkey “got the best” of Russia in this (“choreographed”) exchange. Looking beyond this success, Russia will probably have to repeat its tried-and-tested method of perception management in Syria very soon again in the near future if what reliable Russian journalist and high-level analyst Maxim Suchkov reported earlier this morning on Twitter is true. This well-connected member of the country’s expert community told the world in a series of tweets that Syria’s hated foe, “Israeli” “Prime Minister” Benjamin Netanyahu, is “playing (an) important intermediary role [between] Putin & Trump now (an option Russia has long been favoring)”, and the possible de-escalation that these mediation efforts may have yielded would essentially shatter all manner of “political correctness” by provocatively implying that “Netanyahu saved the world” in offsetting the “apocalyptic” “World War III” nightmare that most of Alt-Media has psychotically fear mongered about all week. However Lavrov does it, it can be expected that he’ll creatively come up with another Afrin-like “solution” for “placating” Syrian society and staving off the dangerous scenario of anti-Russian demagogues exploiting this “inconvenient” possibility.